- Apparently the bristles were borne as a protection against spore eaters only on the upper parts of the plant which became less often silicified than the submerged parts. Hence the latter (Figs.3,4) are less easily recognized as Trichopherophyton. 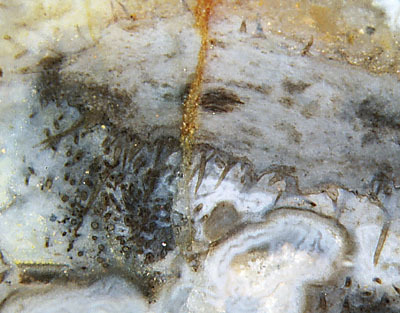 - Trichopherophyton seems to be prone to quick decay, except for the xylem strands and sporangia, which are not easily recognized when found scattered in the chert. 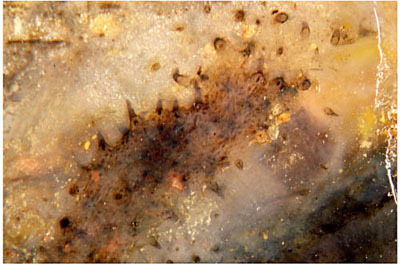 Fig.1: Trichopherophyton, literally "hair-bearing plant", shoot tip silicified while lying in water. (See big swamp gas bubble below and small level bands indicating horizontal direction below left.) The shoot seems to dive into the picture plane towards the left, winding such that a bunch of bristles at the very tip are directed out of the picture plane towards the observer and thus are seen in cross-section. Width of the picture about 7mm. 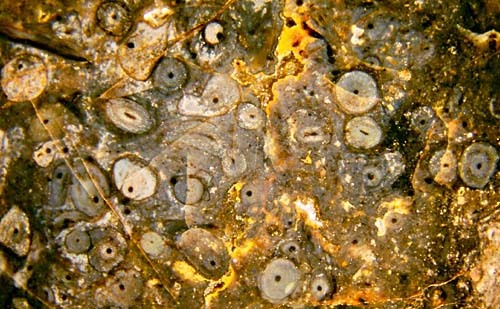 Fig.3 (below): Numerous Trichopherophyton cross-sections without bristles, width of the picture 18mm. 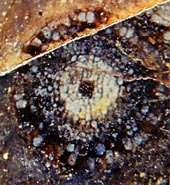 Fig.2 (right): Rare view from inside a Trichopherophyton shoot into the bristles which are seen here as hollow cones with a dark dot of shrunken cell content. Fig.4 (middle): Trichopherophyton cross-section, width 1.5mm, with uncommonly distinct aspect of the different tissues. 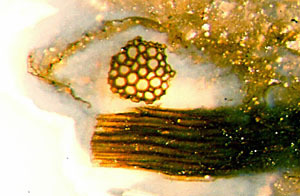 Fig.5 (right): Trichopherophyton cross-section, width 1mm, grown inside an older one. (7) sporangia sections of various shape, never circular, (see Rhynie Chert News 22). Fig.6 (far left): Trichopherophyton xylem fragments, cross-section 0.16mm. Fig.7: Scalariform pattern faintly seen in the tracheids of the xylem strand. The divergence of the tracheids is due to the forking of the strand. If one or more of the above features are met, one should first make sure that there are no features suggesting the presence of other species. (For example, (1) combined with a wart-like outgrowth on one of the circular sections would mean it is Rhynia. Diameters exceeding 3mm would rule out Trichopherophyton, etc.) Then one should carefully inspect every inch of the sample for hidden sections with bristles attached. In case of (5), one can be quite sure that it is either Trichopherophyton or Ventarura, another zosterophyll. In the absence of fragments of the upper part of Ventarura with the characteristic persistent tube (previously thought to be sclerenchyma) it may be difficult to tell the two species apart. In view of the fact that all pictures have been taken with incident light on arbitrarily chosen cut faces, what is seen in Fig.6 is an extremely improbable configuration: By queer coincidence, a xylem fragment had been cut exactly across in such a way that only a short section of a few dozen micrometers extends into depth. Against the scattered light from the surrounding translucent chalcedony, it looks like a piece of lace illuminated from behind. The dark xylem fragment seen below is positioned such that it had been cut nearly lengthwise. Considering that the fragments do not belong to any one of the common plants in the chert but to Trichopherophyton, which had first been described as late as 1991, this image is really awe-inspiring.